Arrambam's Telugu version titled Aata Arambham will also have a simultaneous release along with its Tamil version, which is touted to come on the 31st of October. Yuvan is currently working on the re-recording and he is expected to be done with it anytime soon. 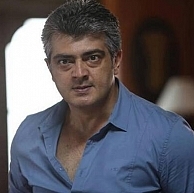 Ajith has already dubbed for the movie in Mumbai and the film is gearing up for its release. With the presence of stars who are popular in Andhra such as Nayanthara, Rana and Taapsee, Aata Arambham can be expected to take a good opening in Andhra too. Prior to this, the Telugu version of Ajith's Mankatha, titled Gambler was a decent success in 2011. Aata Arambham has been shot extensively in Mumbai, Dubai and Kulu-Manali and it is believed to be a rollicking action entertainer. People looking for online information on Aarambam, Aata Arambham, Arrambam, Vishnuvardhan will find this news story useful.